Update 9/12/11: This post is, happily, now obsolete! All episodes are now available for download. I've retained it as an example of the technique. 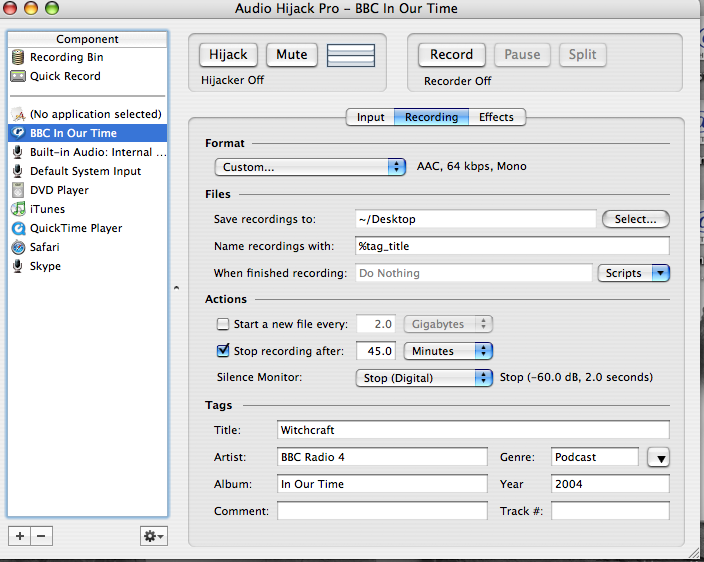 AudioHijack Pro (I think there are now cheaper, better alternatives, but I own it). What you need from the archive site is the URL for the real audio stream. Consider the superb 2004 episode on China: The Warring States Period. The URL you need to copy to the clipboard is in the 'Listen Again' box above Melvyn's picture. 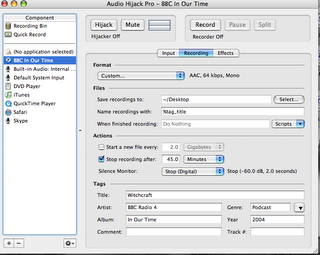 Set this up once and save it: Capture as 'mono' with a bit rate of 64 kpbs. Using AHP properly you can set all the tags you want in advance, including autonaming the saved file with the title tag using the %name% variable. You can also set the time to 45 minutes and auto-stop on silence. Use bookmarkable AAC as a format so you can readily return where I left off. Save these as your default file (See screen shots at bottom). Paste the URL you got into the source field. 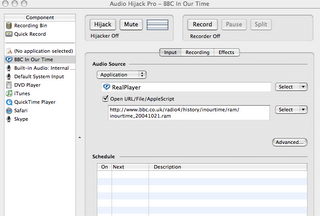 Edit the title field and the date fields in AHP to match the episode. 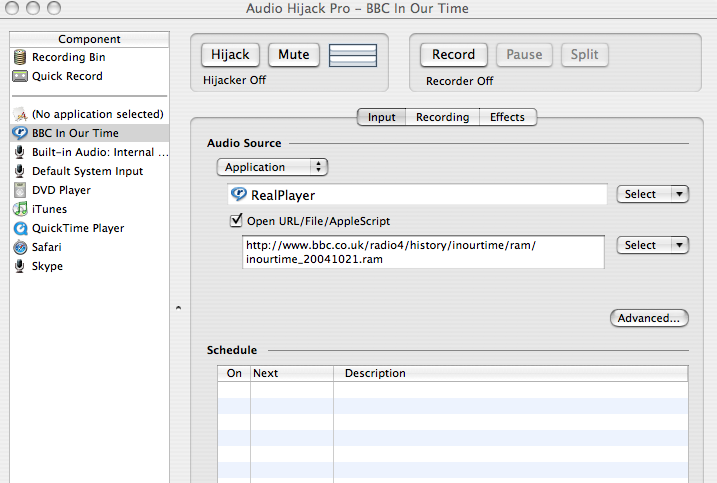 Click Record and AHP will launch RealAudio. It will stop automatically at the time you specified or when the RA stream ends. You have to either exit AHP or click ‘Hijack’ to close the file you created. The file is about 20MB. Now drag and drop the file to iTunes. It won't show up in the podcast menu on the iPod (since it's not), but it's easy to create an 'In Our Times' playlist that includes both the shows delivered via podcast and those delivered via AHP.